If you're like me, then you absolutely love Tocca candles. At one time or another, I've tried every scent -- in both the small and large sizes -- and I've literally loved them all. There's something about the elegant presentation of delicate white wax poured into a glistening glass holder that just makes me happy every time I glance at one of the many iterations littering my apartment. (At last count, I had at least 10 scattered around my bedroom, bathroom, living room and kitchen.) So it comes as no surprise that I would immediately fall in love with the Tocca Candele de Viaggio Holiday Box. 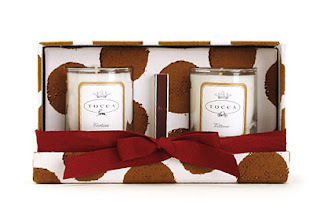 I'm completely enamored of the box alone -- the sturdy white canvas is emblazoned with a splashy brown polka-dot pattern that was inspired by Tocca's 2006 Resort collection and just looks so fabulous as a centerpiece on the bathroom vanity or in the boudoir. Once you untie the red ribbon and open the box, however, the real fun begins. Two Tocca Candelinas lie within the box, and each is so utterly enticing that it's impossible not to fall head over heels instantly. I love both of the scents included in the box -- Vittorio is created with rosemary and pine, while Cortina is infused with Elemi wood and a blend of spices. They both make me feel warm and fuzzy when lit -- they actually make me long for cool fall evenings when the leaves just start to turn colors and I can light my first fire of the season in the fireplace. Each of the Candelinas in this set measures 2.8oz. and has a 20 hour burn time, which is definitely worth the $48 price tag on Tocca's website! You'd better hop to it if you want to purchase this set, however -- it's limited-edition, so you know it will go quickly!